As a medical professional, I strive to not only provide excellent health care, but also educate my patients so they can better understand their health and wellness. I have taken this concept outside of my clinical setting to offer public speaking engagements. For many years I have held educational events in my personal business and have spoken for numerous other organizations. 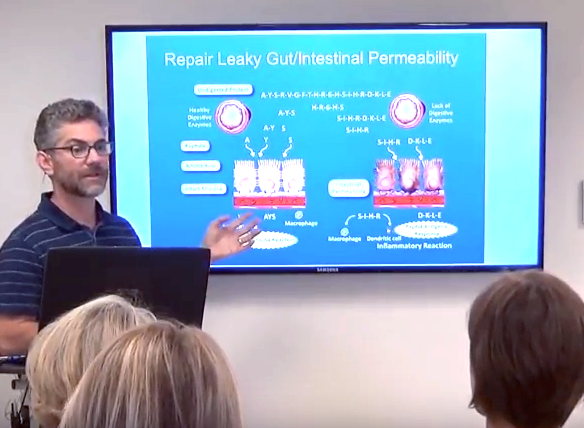 Understanding Gut Health & How to Heal "Leaky Gut"
I can provide my expertise in the wellness arena to corporations, businesses, and/or local organizations who are interested in providing an educational resource to their employees or members. Investing in wellness has shown to increase productivity, reduce sick days, and foster happier people. I look forward to working with you to empower and support the vitality of the people in your organization. To inquire about rates and availability, please use the form below. You should hear back within 24 hours.